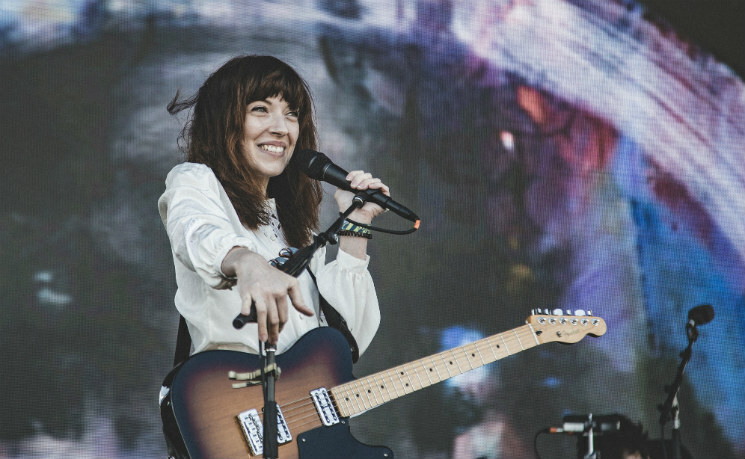 The subtle atmospherics of shoegaze-lite British indie rock unit Daughter were completely lost on the Bestival Toronto crowd on Sunday afternoon (June 12). Having played (and sold out) the nearby Danforth Music Hall less than three months ago, it seemed as if the band's fans collectively chose not to make the trek down to Woodbine Park to soak in their reverb-heavy, minimalist music, but singer and guitarist Elena Tonra managed to deliver her haunting vocals and melodic riffing with aplomb, occasionally captivating the crowd during her song's quieter moments, before (strangely) losing them any time lead-guitarist Igor Haefeli and drummer Remi Aguilella shook the stage with their digitally delayed washes of sound and echoing percussion. It was like the Bizarro version of a Daughter show ("Youth" was the only track that elicited cheers), but still managed to sound amazing regardless — a testament to their onstage strength and poise.